If you are not already using Google’s Search Console service to monitor how well your website is performing in Google searches, put signing up for the service on your to-do list for today. 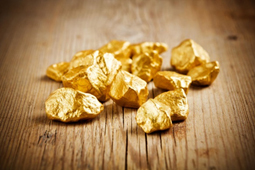 The intelligence and data Search Console provides is like nuggets of gold just waiting to be mined. Business owners, website managers, and digital marketers, regardless of their level of technical expertise, can use Search Console easily and apply the takeaways they learn to strategically enhance the performance of their website, including increasing traffic and improving conversions. One especially important reason to be signed up for Google’s Search Console service is to utilize the intelligence the data provides – those nuggets of gold – to improve your website’s SEO. Without search engine optimization, your website stands little chance of ever showing up in a Google search or getting found. The following list provides ways to use those nuggets of information to quickly and easily improve your site’s SEO. 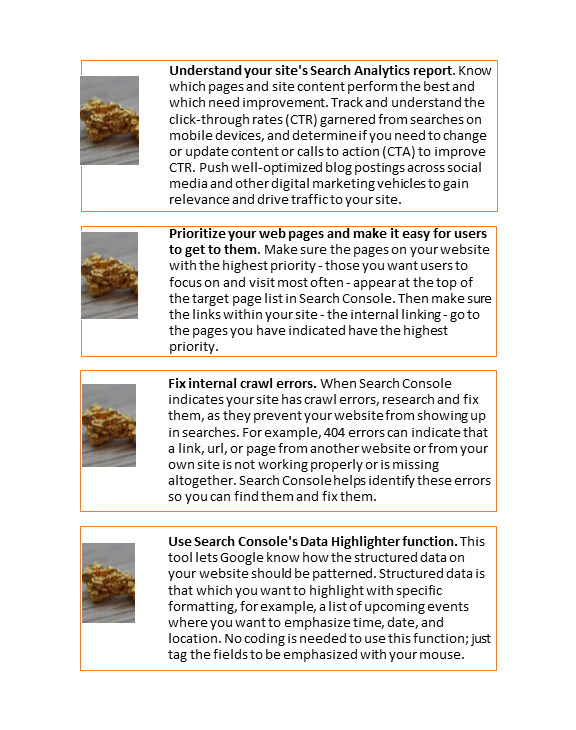 Take advantage of all the functionality Google provides to monitor your website’s performance and see where improvements are needed or things need to be fixed. When you systematically address the technical areas of your website that impact SEO, you both improve the ability of your site to rank well in searches and enhance the user experience across the entire site. The end results are well worth the effort. At Perfexion, Inc. we put our web development and web content expertise to work for you. We are a Philadelphia-based web design and development company located in Plymouth Meeting just outside King of Prussia. We specialize in making sure clients’ websites are technically sound and perform to the best of their ability at all times. Contact us today. Online marketing is a broad term that refers to the marketing of goods and services using available digital technologies. This article will encompasse both SEO and SEM basics. The most common digital technology used is the internet. A company or business that has a website is already doing online marketing to advertise their business; promote their product and service offerings; and/or announce sales, promotions, news, and events. But the extent to which they are successful with their online marketing efforts is a different question altogether. You already know how important online marketing is to the survival of your business. If you don’t market your company – or market it well – potential customers may never know you exist and they will shop elsewhere. By understanding the basics of online – digital – marketing, you have the knowledge and power to put digital marketing strategies and techniques to work for you. As technology and digital platforms have evolved in recent years, so has online marketing, which, today, comes quite close to being an exact science. Online marketing is also known as internet marketing, digital marketing, and web marketing, and the phrases are often used interchangeably. Search engine optimization (SEO) and search engine marketing (SEM) are two strategies that fall under the online marketing umbrella. They work in concert with each other to produce the desired results of increasing and enhancing a company’s online presence and relevance to targeted users – that is, to clients and potential clients – to improve conversions, increase web traffic, provide more qualified leads, and ultimately, grow the business and profits. Search Engine Optimization (SEO) – involves taking steps on a website with the goal of increasing the site’s ranking and visibility within search engines, so that it can be easily found when people search for the goods or services the business offers. o Involves having quality (well written) content and relevant backlinks, as well as a properly managed and maintained website in terms of HTML coding, sitemap, etc. Search Engine Marketing (SEM) – is placing paid online ads that appear alongside other search engine results when a user performs a search and meets the targeted location, demographic, and other criteria associated with the ad. SEO and SEM strategies both require close attention and maintenance to know what is, or is not, working. Savvy web developers continually test, monitor, and adjust ads to ensure each ad investment returns the maximum results. They track which keywords perform the best and can make real-time adjustments if they see something is not working or is performing poorly. The benefits of doing paid advertising include attracting more customers and new website traffic. A properly run ad campaign will rank well in search engine results, and ensure ads appear in front of the very people who are looking for a company’s specific services. This ensures the people who visit their site are the most qualified and are more likely to follow through with a phone call or inquiry. Occasionally, the way search engines index web pages and websites and present results to search queries can change. Such changes can affect the performance of SEO and SEM which, in turn, may require a change in the strategy a company uses when doing its online marketing. Good web developers follow and stay abreast of the trends and updates in internet marketing that affect their clients, and inform and educate them on the topic. If your own web or IT team is too busy managing other aspects of your business or website to keep up with the lightning-fast changes that occur with internet and search engine marketing, contact a reputable web development company for information on the latest requirements. Some will even perform an audit of your website and recommend changes or updates you’ll need to make to ensure your existing digital marketing efforts remain effective. Perfexion, Inc. specializes in online marketing and understands what is needed for a website and all related digital marketing efforts to perform at optimum levels and achieve maximum results and profitability. We are a Philadelphia-based web design and development company located in Plymouth Meeting just outside King of Prussia. We specialize in making sure clients’ websites are technically sound and perform to the best of their ability at all times.